Mivuyo Ngubo (Black Cats ) fighting for the ball against Ayakha Ras (Young Blues). 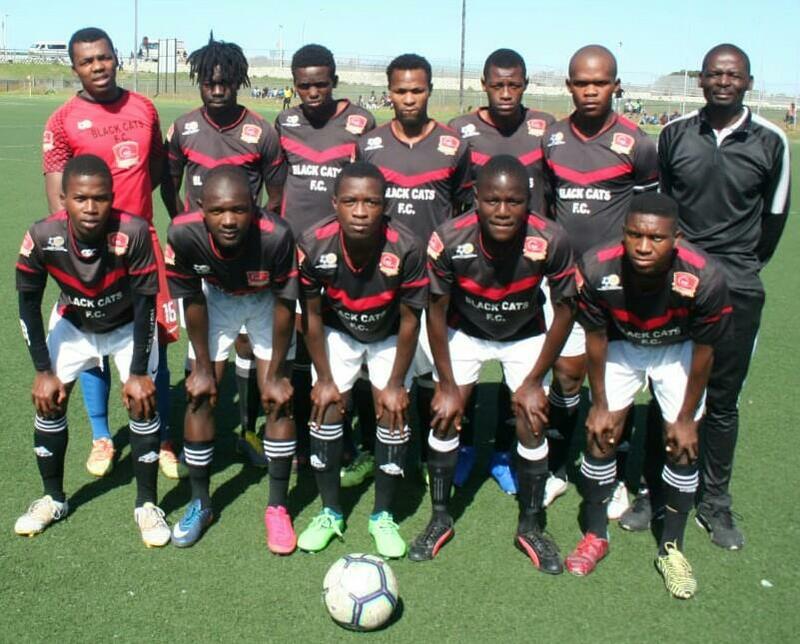 SOCCER NEWS - The Lawaaikamp Stadium was overflowing on Saturday afternoon, 6 April as the two Lawaaikamp rivals battled it out in an SAB Regional League second leg derby game. The energy and excitement at the stadium was felt to the far corners of the field with the supporters of both teams rooting for their clubs. As usual when Black Cats and Young Blues play each other, the two teams went all out. Black Cats emerged victorious with a score of 3-2 after a nail-biting game that kept supporters on the edge of their seats. The referee was Thabo Twayise. Goals were scored by Luyanda Laho (2) and Viwe Mawindi for Black Cats and Zweni Mvuyisi (2) for Young Blues. Black Cats scored three goals in the first half. With both teams trying to create scoring opportunities, some slick interplay by the Black Cats midfielders put Luyanda Laho in a position to score from the eighteen yard area, but his shot lacked power and Bongani Vimba, the Young Blues goalkeeper, made a comfortable save. Next followed a free kick for Young Blues, taken by left-footed Asithandile Zweni, but stopped by Black Cats shortstop Sipho Jacobs. Black Cats grew confident as the match went on, threatening the Young Blues centre backs Sipho Phendukwana and Kokwe Xolisa. A marvellous pass played in by Tsepo Mbenyane forced Xolisa to play a back pass to Vimba. The ball was intercepted by Laho, who scored the first goal of the game for Black Cats. An attempt by Young Blues' Phendukwana went over the cross bar. Black Cats received a corner but failed to score. Constant pressure on the Young Blues backline by Laho, Mbenyane and Siyabonga Situlo caused the Young Blues defender Xolisa to commit a foul inside the box. The penalty was taken by Viwe Mawindi, who scored the second goal for Black Cats. Situlo played in a beautiful pass but Shane-Lee Windvogel missed the target. 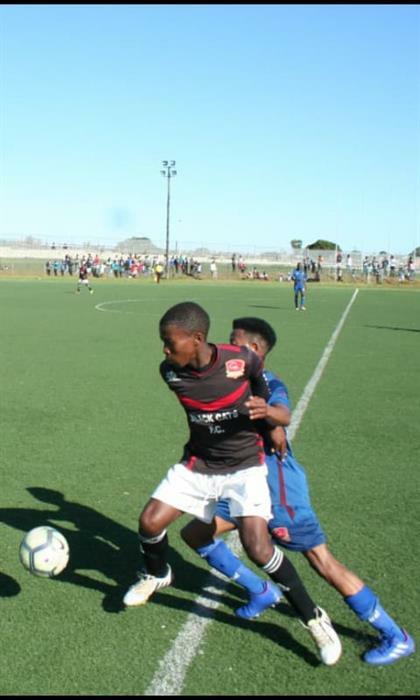 Despite all efforts by Young Blues players Thulani Zakade, Victor Zweni and Ayakha Rasi, Laho scored another goal from a pass played in by Windvogel. The exciting first half ended with Black Cats leading 3-0. The second half featured a strong comeback by Young Blues, who were constantly on the attack. Attempts to score by Young Blues players Rasi and Zakade, as well as Black Cats utility player Mivuyo Ngubo and Windvogel, were unsuccessful. The sustained attack by Young Blues eventually paid off when Zweni Mvuyisi scored two goals in succession. Another chance for Blues to score was missed when Rasi received the ball inside the box and passed it on instead of aiming it at the net. The game ended 3-2, with Black Cats collecting three points. I'm a 45 year old woman looking to meet men between the ages of 40 and 55.